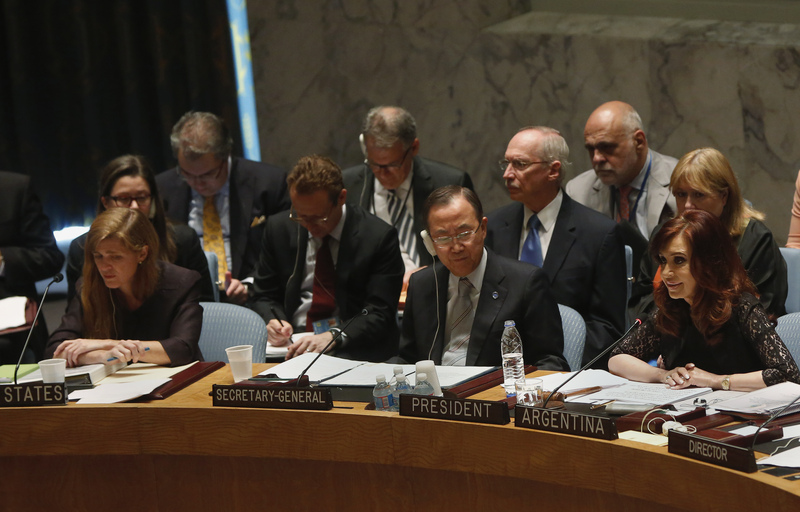 The Security Council debate could determine what happens next on Iran and Syria. When it comes to make-believe foreign policy, usually nothing beats the annual meetings of the UN General Assembly. Each September, member nations of the organization that President Obama recently decried as "paralyzed" each get to perform, sometimes antically, at the podium. And absolutely nothing gets done. That's especially the view in Washington, which more often than not sees the big green building on the East River as a giant, musty encumbrance. But suddenly the United Nations has become freshly relevant, more so than it has been in years, certainly for all of Obama's first term. And new UN Ambassador Samantha Power, who is largely untested as a diplomat, finds herself in a very hot spotlight, one that might even make her predecessor, new National Security Advisor Susan Rice, a touch regretful that she departed New York so soon. Indeed, in coming months the actions of the UN Security Council could determine Obama's major foreign-policy legacy, even more so than his takedown of Osama bin Laden, on the long-festering issues of Iran's nuclear program and Syria's civil war. In both cases a legal dependency on the UN Charter and previous Security Council resolutions will be crucial to success. It already seems clear that it was, more than anything, the sharp bite of UN-approved sanctions on Iran that led to the surprise election of moderate President Hassan Rouhani, who has practically tripped over himself offering to negotiate and whose much-anticipated speech Tuesday is expected to give clues as to his flexibility. It is also clear that previous UN Security Council resolutions dating back to 2006 and demanding that Tehran suspend uranium enrichment will, more than anything else, put Rouhani's sincerity and internationalism to the test. On Syria -- an issue on which Obama has looked consistently weak for two years -- it is also a UN Security Council resolution that will enforce the deus-ex-machina deal that Moscow and Washington suddenly already agreed upon to dismantle Bashar al–Assad's chemical weapons. The Russians are resisting any mention of force in the new resolution, and Obama has pledged to keep open his earlier threat to attack Syria unilaterally if it does not comply. But even here, says John Bellinger, the former legal counsel to the State Department, the president's best argument rests on the UN charter's "Chapter 7" guarantee of the right to "collective self-defense." Bellinger, who served under George W. Bush, says the previous president might have won more support in Iraq had he done something similar. "My advice to Obama would be same: Rather than rely on new and untested theories such as preemption or humanitarian intervention, emphasize more a reliance on the UN charter itself." American policy-makers have rarely paid much respect to the UN General Assembly, an obstreperous talking shop built on the pretense that the vote of Zimbabwe or Liechtenstein is as important as that of the United States. U.S. presidents have also grown impatient with the Security Council, which Franklin Roosevelt set up toward the end of World War II as a global policing body. Presidents, including Obama, tend to see the Security Council as a stagnant pool of lost great-power ambitions, a pretend-place where a Russia can puff itself up into an image of its former self. Under Vladimir Putin, Moscow has often done just that, vetoing every resolution that might have authorized an intervention in Syria over the last two years. But now Russia has publicly committed itself to a UN-authorized dismantling of Syria's chemical weapons—and if Moscow follows through, that will achieve the double victory of curtailing Assad's activities and co-opting an increasingly roguish Russia back, to some degree, into the international system. The fact is that, as Obama is discovering anew, the Security Council remains the main repository for international legitimacy—which is another way of saying it's the most effective way of getting other nations to ally with the United States. As we are finding out anew, the growing body of UN Security Council resolutions is what gives American foreign-policy goals the heft of international law, rather than the stigma of a diktat from Washington. So all eyes are on New York. Let the diplomacy begin.